Back to Back Birthday celebrations of genre blurring babes happens this week as we move from Solstice to Equinox. Next up we have the delightful Irene Reid. Equally hitless and loved on stage as Marlena Shaw, she would have celebrated her 85th Birthday this September 23rd. 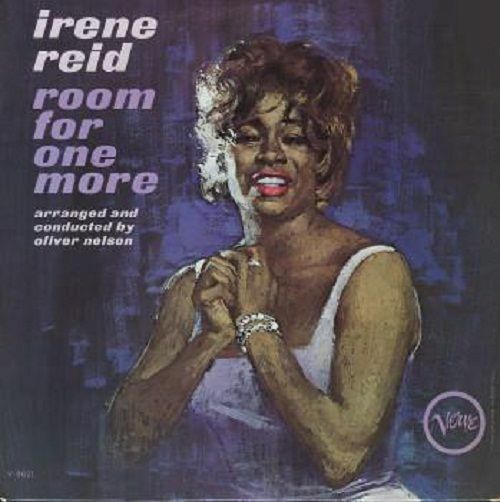 Irene got a remarkably late recording start, although she had been singing since winning Amateur Night at The Apollo in 1947. Her first recordings didn’t come until after her stint with the Count Basie Orchestra in 1961-62. By the time she was picked up by Verve records in 1963, there was some confusion about where to take the then 32 year old Reid. Far more gutsy a blues singer tough enough for more R&B outings, she wouldn’t be following in the footsteps of gauzy strings and overblown horn sections right away like some of her contemporaries that had been in the studio far longer than she. Indeed, she took a page from Eydie Gorme, whose massive Top Ten Hit “Blame It On The Bossa Nova” made that Middle aged MOR Queen hip again. As that song peaked in the early months of 1963, Irene took on the follow up, still written by Cynthia Weil and Barry Mann. With Leiber and Stoller at the helm in the producers booth, Irene’s take on romance courtesy of the swivel of some hips decidedly had a more rocking flavor. For whatever reason though, the single sank without a trace in the Spring of 1963. Nevertheless, Irene would go on to record a variety of Material for another 4 decades. It truly proved only the beginning. Make sure to check out the rest of her discography.